I think the planets must have aligned or something because dinosaurs seem to be converging on Brisbane. In 2015 you can be mesmerised or terrified or fascinated, or perhaps a combination of all 3, at a number of dinosaur experiences that are as authentic and life-sized as they can be. The world of dinosaur modelling is a pretty sophisticated space these days. No longer will you find cheesy, stilted representations of these colossal creatures. Paleontologists, engineers, model makers and puppeteers work in collaboration using the latest scientific knowledge, technology and artistry to produce high-tech experiences that will have you believing you're really in the company of dinosaurs. Here are my picks of the best of Brisbane's 2015 'dinosaur express'. 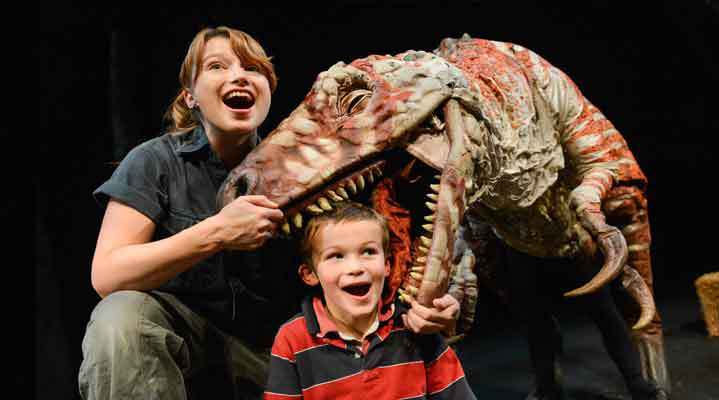 If you hurry you can still get seats for the final summer performances of Erth's Dinosaur Zoo at QPAC. The season finishes on Sunday 18 January. These dinosaurs are state-of-the-art, life-size puppets operated by skilled puppeteers who ensure the performance is seamless and entertaining. I have attended an Erth Dinosaur show with my grandson and can personally attest to the magical atmosphere they create with their incredibly life-like presentations. Highly recommended. Dates: From Sunday 4 January to Sunday 18 January 2015. Times: Show times are 9.30am, 12noon and 2.30pm. Each performance lasts for 50 minutes. Cost: General Admission tickets are $25 each or $20 each for groups of 4 or more. 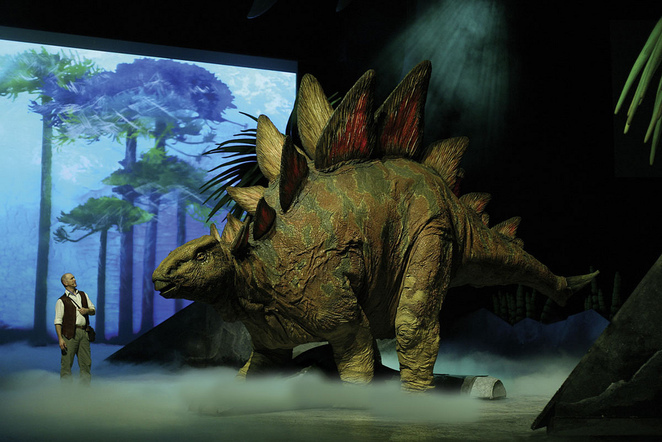 This is the larger-than-life spectacular that has been wowing audiences around the world for many years but this time the giant animatronic dinosaurs have been updated to reflect the most recent scientific knowledge about what dinosaurs looked like. Walking With Dinosaurs - The Arena Spectacular has more than 20 life- sized dinosaurs including everyone's bloodthirsty favourite, Tyrannosaurus-Rex. Dinosaurs from the Cretaceous, Jurassic and Triassic periods featured in the show. Dates: From Wednesday 1 April to Sunday 5 April 2015. Times: Show times are 11am, 3pm and 7pm - not all times on all dates. Performances consist of 2 Acts of 40 minutes each with a 20 minute interval. Tickets: Can be purchased online here. Cost: Ticket prices range from $41.70 concession to $101.85 premium seating (plus a $6.45 fee per transaction). School group discounts, Meet and Greet packages and VIP Experiences are also available. 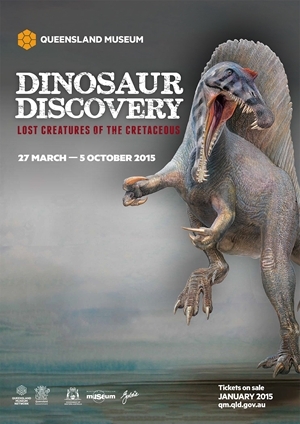 After its successful season at the WA Museum last year, the creators of Dinosaur Discovery: Lost Creatures of the Cretaceous are bringing this fascinating exhibition to Brisbane as the first leg of its world tour. Lucky us. Visitors will be able to get up close and personal with some scary favourites like as spinosaurus, velociraptor and the ubiquitous T-Rex, as well as lesser-known Australian dinosaurs like the cute, wide-eyed Leaellynasaura, and Queensland's own Muttaburrasaurus and Australovenator. The exhibition opens on Friday 27 March and runs until Monday 5 October 2015. Tickets go on sale at the end of January so check the Queensland Museum website for more information or check back here towards the end of January for ticketing and pricing details. Why? 3 terrific dinosaur experiences. When: Various dates throughout 2015. See article for details. Cost: Varies. See article and websites for details.